A sequel to the Brimstone deck. Everything has been upgraded and reworked from the top down. All of the elements of the deck have been updated to fit with this new design but remain within the same theme as the Brimstone deck. 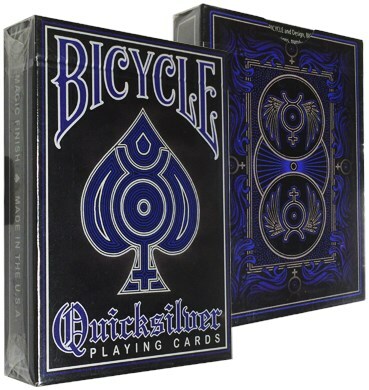 The Brimstone deck featured gold metallic ink, similarly, the Quicksilvers are trimmed with metallic silver ink. Court cards, aces, even the numbered cards have custom work that will look right at home next to the Brimstone deck or will be the gleaming highlight of your collection. Designed by Russell Kercheval, this black faced deck is completely customized. It is made using traditional Bicycle stock and has Magic Finish for improved handling and durability. You also get 2 extra cards for all you magicians out there, a double backer and a gaff card. This is a limited production deck, with only 2,500 estimated to be printed.